Years ago, I had a design business (in addition to teaching) that I named House Calls. together we walked through each room and discussed and listed suggestions for changes. Sometimes those suggestions were very specific (paint this, move this here) and sometimes they were general. My clients were often friends or someone who called me because of a recommendation. a donation I made to a church or social group’s fund raising auction. *As my sorority sister and dear friend in college used to say, ‘everyone is doing the best they can’. Design is all in the eye of the beholder. *Design choices are easier for someone who is what my mother, daughters, and I have always called ‘a house person’. Note: I did not say a design person. For example, I love houses in all shapes and sizes. I love your home, and I haven’t ever seen it. I love thinking about houses and imagining what I would do to that house. I love the potential that exists in all houses. That is a house person to me. You are a house person too. *Houses have bones and recognizing those bones and how to enhance them and fit your needs is really all design is. *Some houses were born with problems. It isn’t your fault. How do you know what those problems are? 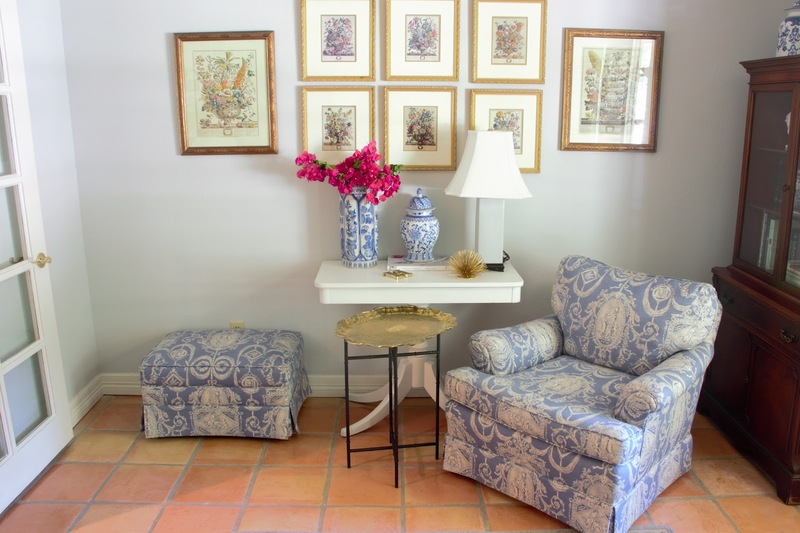 Are their walls in rooms where furniture can logically rest? Is there enough space on a bedroom’s headboard wall for side tables to live- with electrical outlets and without blocking windows? If you plan to float furniture in the middle of the room, are there floor outlets? And honestly, an important question in most homes- what wall will the television be on? 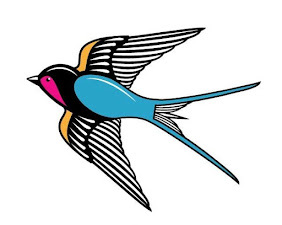 We are all designers. You are a designer. You design your own life every single day. As a result , you are a home designer too. Our home has a long living room. Having something on the end walls helps anchor the space . I use a piano to do just that. 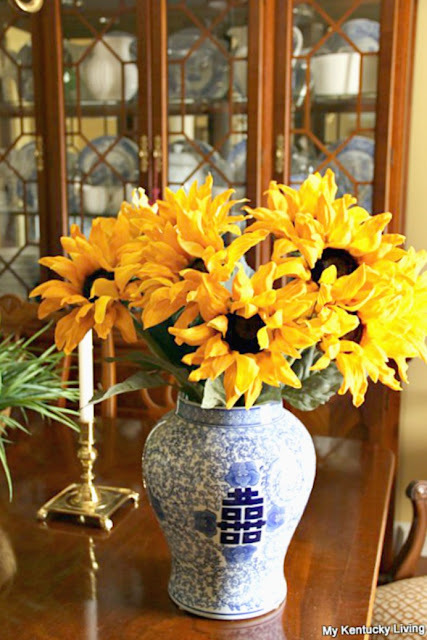 Rather than using a piano to only hold photographs or other small items, try treating it as a mantel instead. You know I have hosted many parties in our home over the years, and I have assisted in co –hosting just as many others. I learned something recently, however, about an unlikely yet very well known party food that I wanted to share with you. ‘A vegetable tray’ on the list of ‘what would you like to bring?’ items for a party has never been my favorite. Maybe they too have a PR problem like congealed salads? Having said that , vegetable trays were also a prime choice for the exhausted, the over worked, the I can’t do another thing in all of us. A quick call to HEB to place an order for a tray and you were done. That has its appeal doesn’t it? I had an epiphany this past weekend though that changed all that. You see , I chose to bring a vegetable tray to a party I was co-hosting this weekend. Anything previously considered dull can be transformed with effort, creativity, and positive thinking. I actually researched vegetable trays and found information and photographs that sparked my interest. And no, I did not carve a bell pepper into a baby carriage this time, but it could happen . rather than HEB’s- conveys a message I think. What is that message? I did this for you because I wanted to. And finally, there are some pitfalls and shortcuts. I purchased HEB’s all time best spinach dip to serve rather than ranch dressing. Ranch dressing seemed like such a tired choice. I gave up on cutting cauliflower. That was not in my wheelhouse. There is a message here sweet girls. Just a little ‘food for thought’… literally . 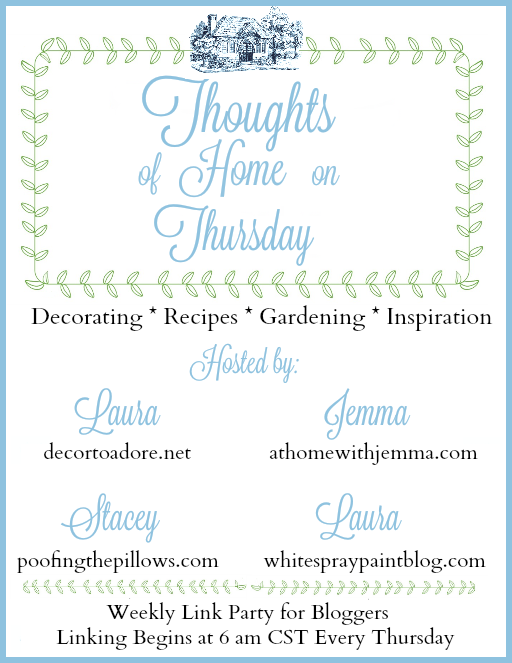 Good morning friends and welcome to week #29 of Thoughts of Home on Thursday. Our hostess this week is Stacey from Poofing the Pillows. 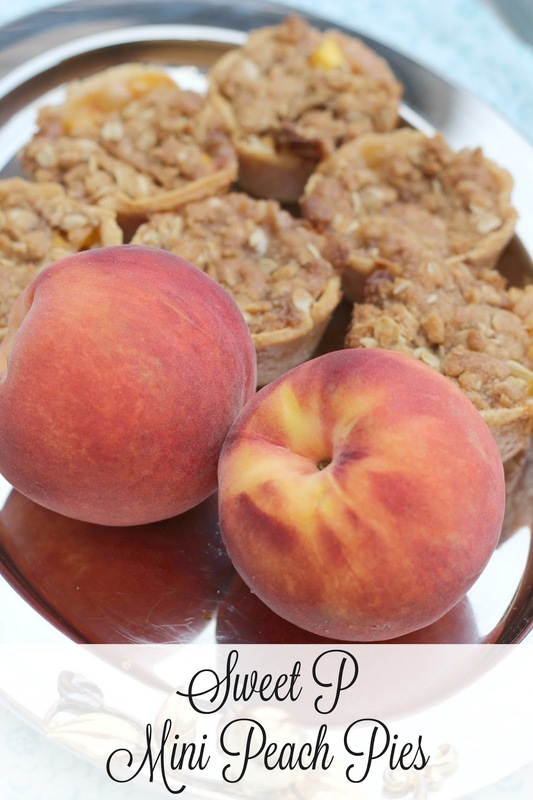 She recently featured miniature peach pies in honor of National Peach Pie Day. These were a hit at home!! 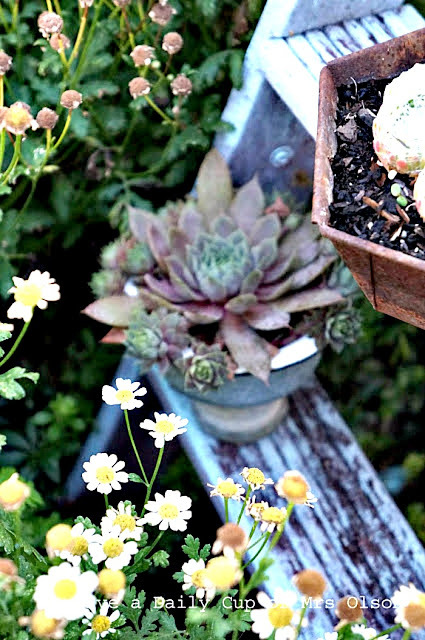 As this summer season ends, Autumn inspiration is already rolling out in magazines and on blogs. Who's ready for pot roast and cute sweaters? Bet you'll find some great fall ideas here this week to spark your energy and creativity. Last week we had 329 beautiful posts linked together. To say that we are amazed and grateful is an understatement. We really do appreciate that you join us each week. Now let's see the beautiful features. 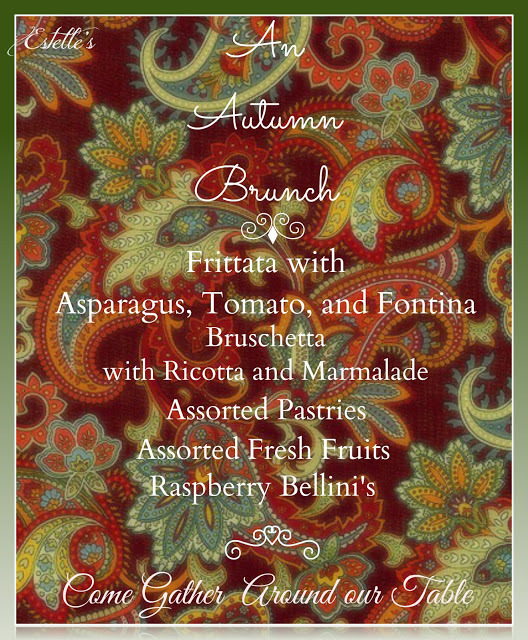 At Estelle's, Betsy whipped up an amazing Autumn Brunch for her family. The menu sounds delicious and the food is mouthwatering. The sweet part is this is for her family. What a blessing! 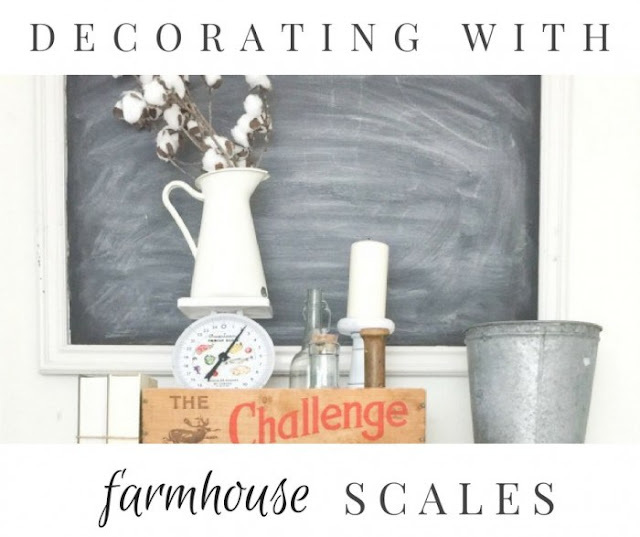 Decorating Sara at Twelve on Main loves gorgeous farmhouse style decorating. She shared her ideas for decorating with scales last week. This post makes me want to go to the flea market and find some for myself. At Garden Therapy, Stephanie shared her 10 favorite plants to choose for wonderful fragrance. I'm keeping this list handy for next spring. 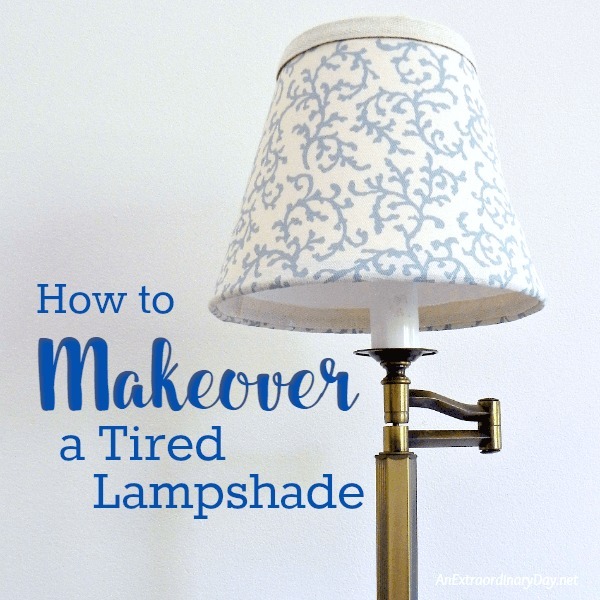 Diane at An Extraordinary Day showed us how to completely change the look of a lamp by covering the lampshade. 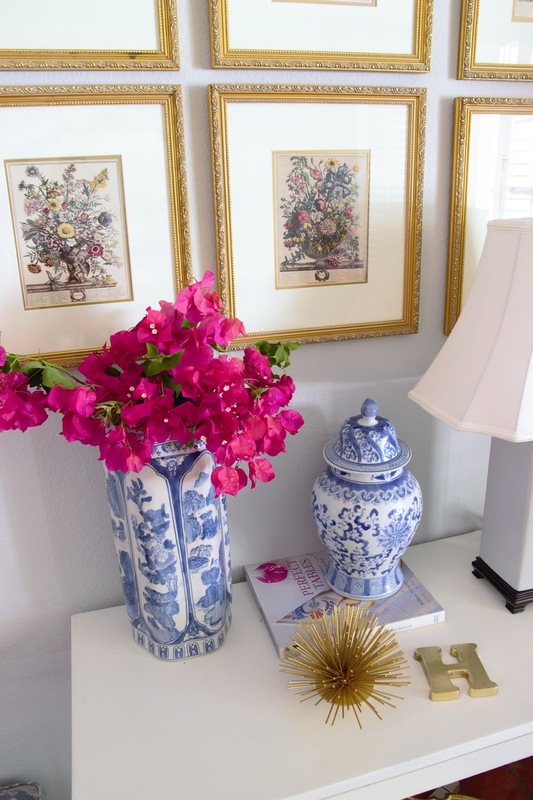 It's the little things like this that make a home look personalized and stretch your decorating dollars. 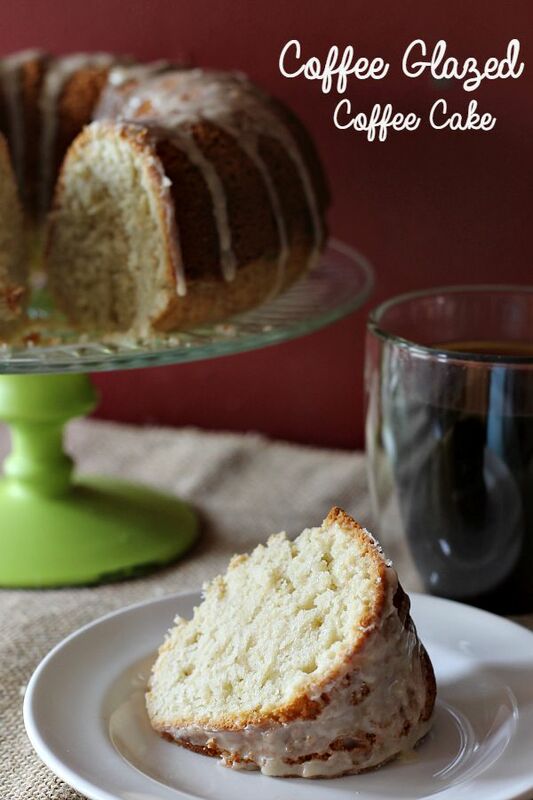 Recipes And last but not least, Brett from This Mama Loves created a Coffee Glazed Coffee Cake that is a winner for sure. I can imagine this being served to friends and family this fall or during the holidays. delicious to tide you over during this hot month of August. This recipe for Strawberry Congealed Salad is a Ranch Recipe family favorite. then you know they are family works of art. and they are loaded with hidden treasures. This is the perfect congealed salad for ladies' luncheons or special family gatherings. Dissolve jello in boiling water. Drain pineapple, reserving juice. Add 1/2 cup pineapple juice to dissolved jello. Add thawed strawberries, pineapple, and nuts (optional). 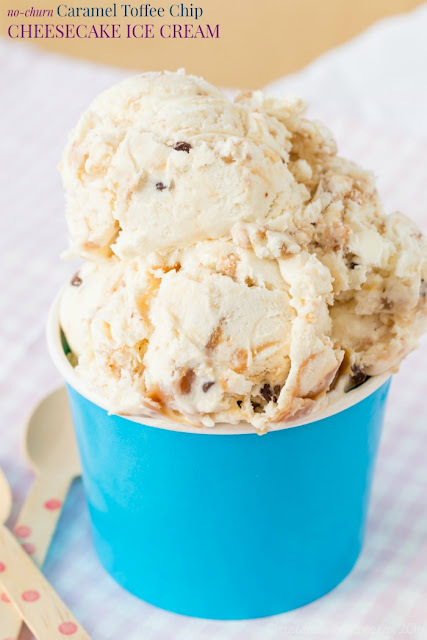 Put half of the mixture into a 9x13 glass pan and place in the refrigerator until set. When set, spread the sour cream over the congealed portion. Chill. Then add the rest of the strawberry mixture and return to the refrigerator until set. Want my posts delivered directly to your inbox? Just enter your e-mail address. Thank you for joining us for the 28th week of Thoughts of Home on Thursday. blogging conference held in Atlanta, Georgia. 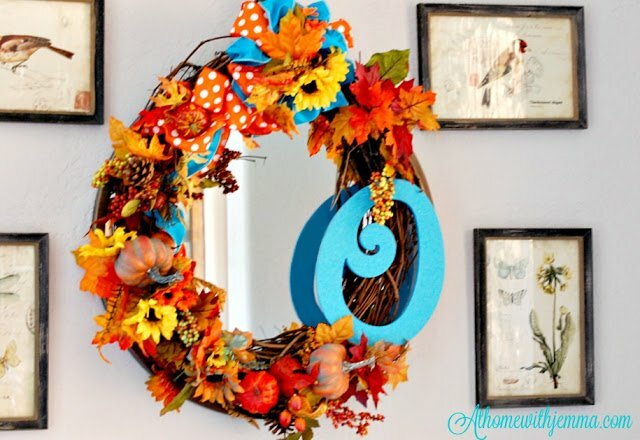 She came home inspired and motivated, and went right to work creating a Harvest Wreath. 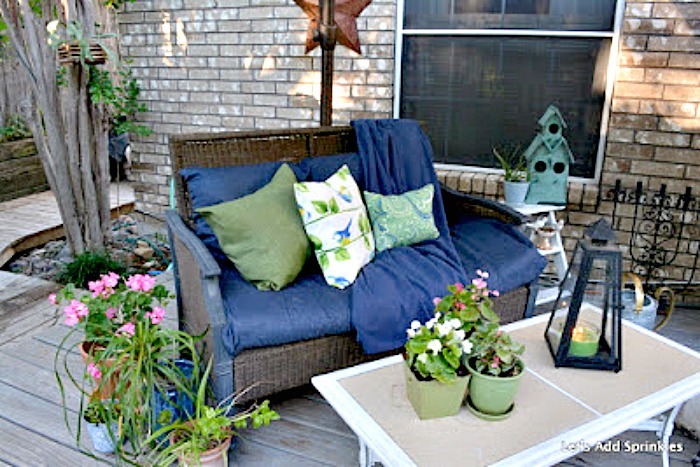 If you have the chance drop by and visit Jann at Have a Daily Cup of Mrs. Olson. seasonal change in her home, you will find her at My Kentucky Living. Katie from Let's Add Sprinkles uses some Texas ingenuity and shows us how to "fix,"
melted candles, pay her a little visit and you can find out how to do it too. 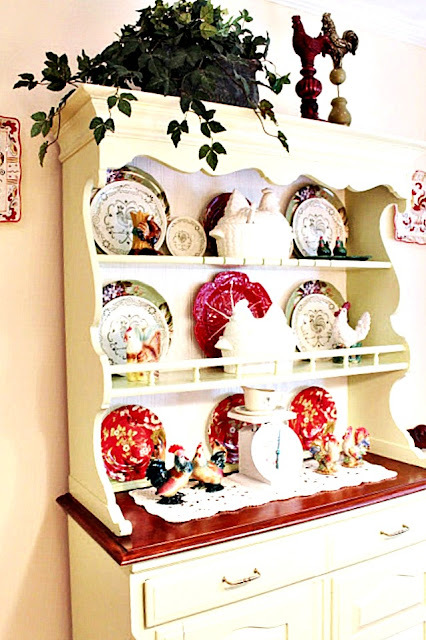 She just recently changed it all up with some beautiful rooster plates, tureens and such. Her tips are always useful so pay her a little visit. 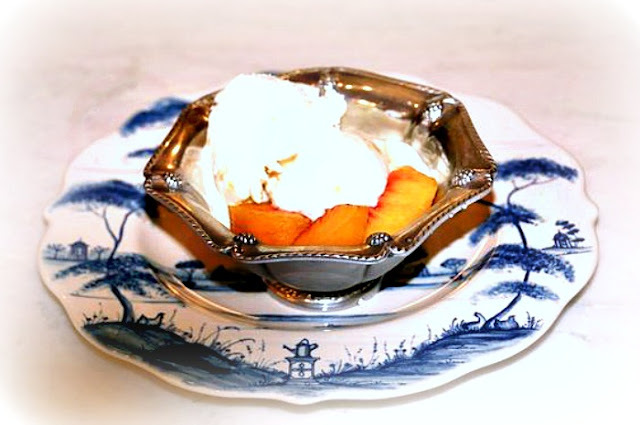 Recipe You cannot go wrong with a dessert that is called Peaches n' Cream. while it is still Peach season. And now on today's party! 1. Link back to this post or any of the four host's websites. By linking up you are providing permission that Thoughts of Home on Thursday can feature your post and accompanying photos on future blog posts or other forms of social media such as Facebook and Instagram. A link back to your blog with always be provided. Thank you so very much for gathering with us and we hope to see you each and every week at Thoughts of Home on Thursday. We can't wait to see what you share. how you live in that home. I may have gone a bridge too far. Yes, everything is at my fingertips: my laptop is on the ottoman where my feet are propped, my cell phone is charging, my Kindle is nearby, and my ever present list and pen is waiting to the right on an end table with a small trash basket underneath. I have a power strip peeking out from the adjacent couch for charging whatever electronic device I am using. I can reach the basket of remotes on the end table to my left (when my husband doesn’t have them). Inside that basket are pens and markers and a measuring tape and ear buds and unopened mail and other things for multi tasking. I can do many of my favorite things (blog, read, call, text) all with the flick of a wrist. And to this all, yesterday I said ENOUGH. They are now all sitting on the dining table in a nearby room. to get to that plan. Right now I am focusing on breathing and other kinds of movement . Please tell me you can relate to convenience created clutter? Here are some things ricocheting around in my steel trapped mind this morning. * In writing a recent post on 5 Tips For Lower Ceilings, I faced a spelling dilemma. I have always spelled moulding that refers to the trim used in a home with a ‘u’. Many businesses who sell such moulding spell it the same way. Then there are those that spelling it molding. The solution? I have no idea. while reading ,’Why is Laura spelling moulding with a ‘u’?’. *Recently I shared information in this post about a series titled Poldark that I said could be found on Netflix. That is completely wrong . Poldark is a PBS series that is available through your Roku or your Smart TV on Amazon Prime. If you are still interested in the series after all of this nonsense, it can be found there or at PBS.org. The term Smart TV and my relationship with the inner workings of my TV are not a fit. It is an ongoing struggle. Remember…we still call the remote the Changer. and present- is now showing an ‘Unfollow’ button instead of a ‘Follow’ button. such ‘follower’ nonsense, but I won’t. I also don’t have a clue why these things happen on Google. The wonderful Linda of My Fairy Blog Mother is looking into it for me. blog and making comments you can hear. I did this once before, but I thought I would do it again. Here was the consensus of the second reviewer. paint or using it very often. He felt I should change the name of my blog. am all about the metaphor. It isn’t about a physical can of spray paint but what my mother taught me to do with it. Remember this first post from the dark ages? 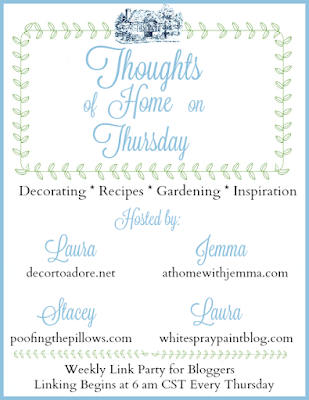 Joyce's blog , At Home With Jemma. Before this post goes into the archives, I thought I would share it here at home. and impractical (at that moment) wedding gifts. 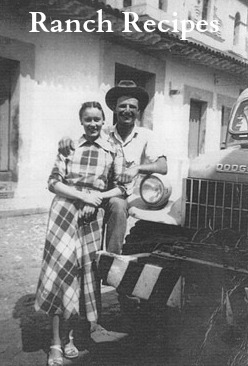 I didn’t need to worry however, because within a day my mother of White Spray Paint fame drove in from the ranch – her car loaded to the top- followed by my father pulling a cattle trailer. Out of that cattle trailer came my white bedroom furniture, a couch and chair,a small dining table and two chairs, and lamps. my Murchison cousins brought gifts, my grandparents brought all sorts of small appliances, all while my mother helped me make this simple, bare place into a home. Also on that day, unknown to me because that was his way, my father had a side of butcher wrapped beef delivered to Gafford’s Meat Locker on 14th street as a gift to us. I may not have been much of a cook then, but with that side of beef, we ate well. I drove to Gafford's every other day or so, went into the meat locker section, and picked out what we were going to have that night. It was usually round steak, Del Monte canned green beans, and a potato . and enjoying what we have. 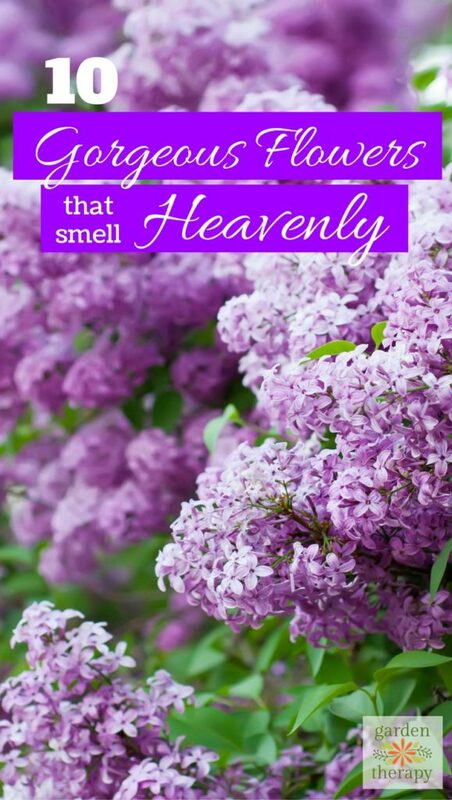 Whether it was years ago and my family was climbing those rickety garage apartment stairs bringing gifts, or it is something I enjoyed today while walking my yard, it is always about enjoying what I have. The flea market finds in the photos above, from the botanical birthday prints, to the lamps, to the brass tray table are simply ways I have made our house a home with beautiful things found in humble places. who stood in that garage apartment while her mother guided her in how to make a house into a home. I know you have that young girl in you too. Welcome to Thoughts of Home on Thursday. It is hard to believe that this is week 27! 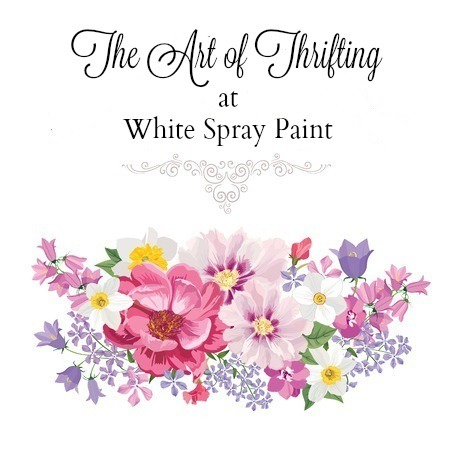 Our hostess this week is Laura of White Spray Paint, who like you is really enjoying instagram. The photo above of a small milk glass pitcher and white plumbago from her garden is taken from a recent instagram post. Don't forget that you can also link your instagram sites below as well as your projects. Now to our favorites this week. 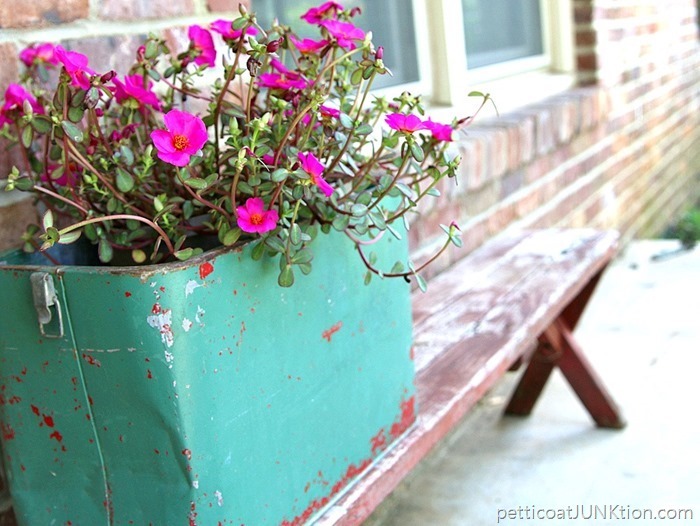 Kathy of Petticoat Junktion shows us that Fun Junky Finds Make Great Flower Planters. 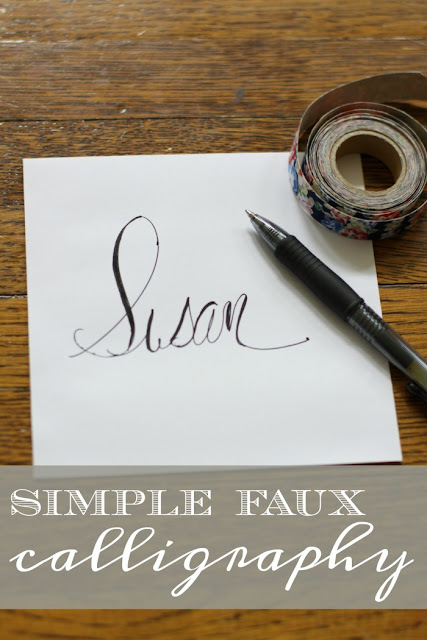 Susan of Love of Home's Simple Faux Calligraphy post has me so inspired, I have been practicing. 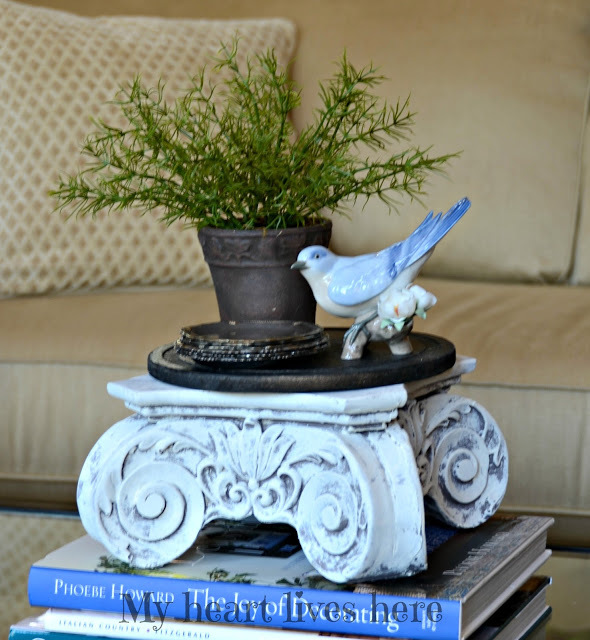 Eilis of My Heart Lives Here takes a decorative capital and transforms it in Capital Pedestal Hack. Debbie of Chatham Hill On The Lake shares why it is important to stage our homes now in Not Moving? 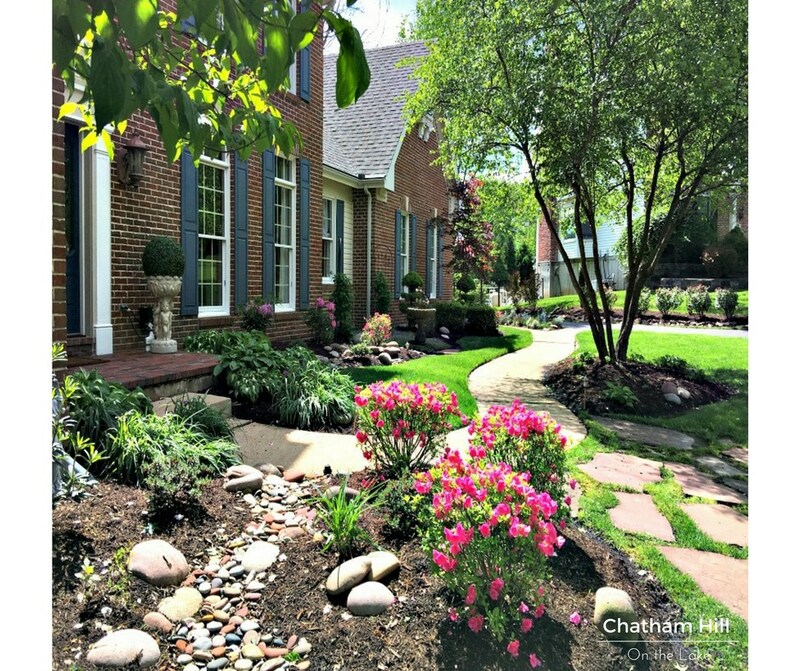 Five Keys to Stage your Home Now and Not Later. amazing recipe for No Churn Caramel Toffee Chip Cheesecake Ice Cream. And now to today's party! 1. Link back to this post or any of the four hosts' websites.